Our BOxER of the month in October was Lynne Fantham. Lynne has the drive and motivation that most people would die for. A solid three times a week helps Lynne stay on track and energised. Lynne loves to attend our early morning 6.30am classes and doesn’t flinch at the idea of squat thrust (she may moan about a burpee though). 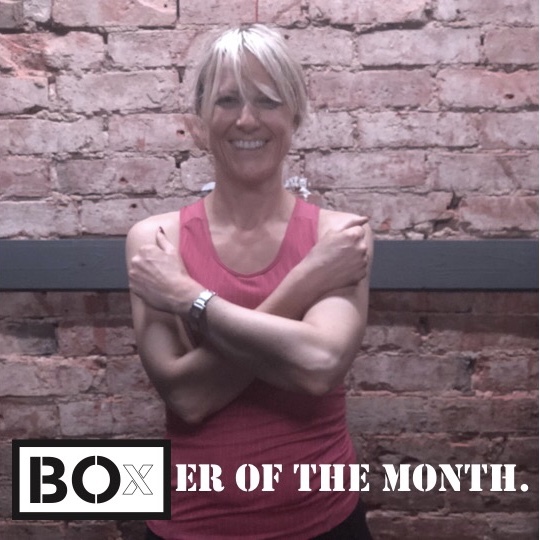 Lynne has become one of the BOxFAM pretty much from the start and we’re thankful for her continued support and sharing her passion for BOx with her friends and family, who have also become regulars. Keep the hard work and dedication alive Lynne. Well done. At the beginning of the year, when I struggled to keep up with my sons on their scooters and they kindly pointed out my wobbly ‘bits’, I decided to try out BOx. After trying all kinds of exercise over the years -running, step, spinning and body pump – I found a new place, somewhere with unique workouts and it was the only classes I’d experienced where I never know what was coming next, so it constantly kept me on my toes. Over the last 10 months I have felt fitter and stronger than ever before and the ‘bits’ are less wobbly and that’s not a bad thing at 46. I bore all my friends recommending BOx, but it’s been a life changer for me and every friend who has come along has caught the BOx bug too.